The 2017 NBA draft was held on June 22, 2017, at Barclays Center in Brooklyn, New York. National Basketball Association (NBA) teams took turns selecting amateur U.S. college basketball players and other eligible players, including international players. The draft lottery took place during the playoffs on May 16, 2017. The 53–29 Boston Celtics, who were also the #1 seed in the Eastern Conference and reached the Eastern Conference Finals at the time of the NBA draft lottery, won the #1 pick with pick swapping rights thanks to a previous trade with the Brooklyn Nets, who had the worst record the previous season. The Los Angeles Lakers, who had risked losing their 2017 first round pick to the Philadelphia 76ers, moved up two spots to get the No. 2 pick, while Philadelphia moved up to receive the No. 3 pick due to the Sacramento Kings moving up in the draft, which activated pick swapping rights the 76ers had from an earlier trade. On June 19, four days before the NBA draft began, the Celtics and 76ers traded their top first round picks to each other, meaning the holders of the top four picks of this year's draft would be exactly the same as the previous year's draft. Markelle Fultz was selected first overall by the Philadelphia 76ers via the Boston Celtics and Brooklyn Nets. Lonzo Ball was selected second by the Los Angeles Lakers. 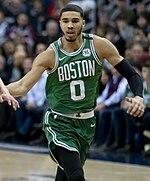 Jayson Tatum was selected third by the Boston Celtics via the Philadelphia 76ers and Sacramento Kings. Josh Jackson was selected fourth by the Phoenix Suns. De'Aaron Fox was selected fifth by the Sacramento Kings via the Philadelphia 76ers. Jonathan Isaac was taken sixth overall by the Orlando Magic. Frank Ntilikina was taken eighth by the New York Knicks. 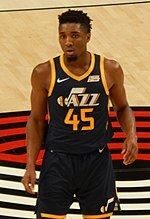 Donovan Mitchell was taken thirteenth by the Denver Nuggets (traded to Utah Jazz). These players were not selected in the 2017 NBA Draft, but have played at least one game in the NBA. The draft is conducted under the eligibility rules established in the league's 2017 collective bargaining agreement (CBA) with its player's union. The CBA that ended the 2011 lockout instituted no immediate changes to the draft, but called for a committee of owners and players to discuss future changes. All drafted players must be at least 19 years old during the calendar year of the draft. In terms of dates, players who are eligible for the 2017 draft, must be born on or before December 31, 1998. Declaration for the draft no longer results in automatic loss of college eligibility. As long as a player does not sign a contract with a professional team outside the NBA, or sign with an agent, he will retain college eligibility as long as he makes a timely withdrawal from the draft. NCAA players have until 10 days after the end of the NBA Draft Combine to withdraw from the draft. Since the combine is held in mid-May, the current deadline is about five weeks after the previous mid-April deadline. NCAA players may participate in the draft combine, and are also allowed to attend one tryout per year with each NBA team without losing college eligibility. NCAA players may now enter and withdraw from the draft up to two times without loss of eligibility. Previously, the NCAA treated a second declaration of draft eligibility as a permanent loss of college eligibility. The NBA has since expanded the draft combine to include players with remaining college eligibility (who, like players without college eligibility, can only attend by invitation). Players who are not automatically eligible had to declare their eligibility for the draft by notifying the NBA offices in writing no later than 60 days before the draft. For the 2017 draft, this date fell on April 23. After that date "early entry" players were able to attend NBA pre-draft camps and individual team workouts to show off their skills and obtain feedback regarding their draft positions. Under the CBA a player may withdraw his name from consideration from the draft at any time before the final declaration date, which is 10 days before the draft. Under current NCAA rules, players have until May 24 (10 days after the draft combine) to withdraw from the draft and retain college eligibility. A player who has hired an agent forfeits his remaining college eligibility regardless of whether he is drafted. At the time, a record-high 185 underclassed draft prospects (i.e., players with remaining college eligibility) had declared themselves for eligibility at the April 24 deadline (138 of them being from college), although college players who had not hired agents or signed professional contracts outside the NBA were able to decide to return to college by May 24, 10 days after the end of the NBA Draft Combine. These players have publicly indicated that they have hired agents, or had planned to do so around the start of the draft; those who hired agents immediately lost their eligibility to return to NCAA basketball in 2017–18. By the end of the May 24 deadline, 73 draft candidates from college decided to return to their respective colleges for at least another year, leaving 64 underclassmen to officially enter the draft this year. Additionally, two more players left entry at the end of the international player deadline, meaning both Maverick Rowan from North Carolina State and Darin Johnson from Cal State Northridge would not return for college, but one player managed to enter the college underclassman deadline, thus leaving 63 entries at hand for the NBA Draft. International players that had declared this year and did not previously declare in another prior year can also drop out of the draft about 10 days before the draft begins on June 12. Initially, there were 46 players who originally expressed interest entering the 2017 draft. At the end of the international deadline, 36 players wound up declining entry for the draft, leaving only 10 international players staying in the NBA Draft. As a result, 73 total underclassmen entered the 2017 NBA Draft. They have completed four years of their college eligibility. They are least 22 years old during the calendar year of the draft. In terms of dates, players born on or before December 31, 1995 are automatically eligible for the 2017 draft. The invitation-only NBA Draft Combine was held in Chicago from May 9 to 14. The on-court element of the combine took place on May 11 and 12. This year's event had Under Armour as its primary sponsor. A total of 67 players were invited for this year's NBA Draft Combine, with 5 more named as alternates in the event some players could not come for whatever reason. Ten invited players declined to attend for various reasons, including three players completely on the international scale. Eighteen more players that were guaranteed invitations were also players testing out their draft stocks during the event. Eleven players participating in the event were seniors, the lowest number ever of combine participants who had exhausted their college eligibility. During the event, six different players were deemed injured either before or during this year's Draft Combine. At the end of the May 24 college deadline, eight players who originally declared for the NBA Draft and were invited to the Draft Combine this year, including potential "none-and-done" Kentucky freshman redshirt Hamidou Diallo, ultimately returned to college for at least one more season. The 2017 NBA draft lottery was held on May 16. The NBA annually invites around 15–20 players to sit in the so-called "green room", a special room set aside at the draft site for the invited players plus their families and agents. When their names are called, the player leaves the room and goes up on stage. Other players who are not invited are allowed to attend the ceremony. They sit in the stands with the fans and walk up on stage when (or if) they are drafted. 10 players were invited to the 2017 NBA draft on June 8, with three more of them being invited two days later. Seven more players would be invited to complete the green room listing on June 14, bringing the total invite list to 20. The following players (listed alphabetically) were confirmed as invites for the event this year. Boston acquired Gerald Wallace, Kris Humphries, Keith Bogans, MarShon Brooks, Kris Joseph, a 2014 first-round pick, a 2016 first-round pick, a 2018 first-round pick and the option to swap 2017 first-round picks; Boston exercised this option on April 3, 2017. Brooklyn acquired Paul Pierce, Kevin Garnett, Jason Terry and D. J. White; Brooklyn also acquired Boston's second-round pick for compensation after the previous season ended. Los Angeles Lakers acquired Corey Brewer and Houston's 2017 first-round round pick. Draft-day trades occurred on June 22, 2017, the day of the draft. ^ Nationality indicates the player's national team or representative nationality. If a player has not competed at the international level, then the nationality indicates the national team which the player is eligible to represent according to FIBA rules. ^ Frank Ntilikina was born in Belgium to Rwandan parents, but represents France in international competitions. ^ T. J. Leaf was born in Israel, but was raised in the United States. He holds dual citizenship with both nations, but has represented Israel during international competitions. ^ Ogugua Anunoby was born in London, England to Nigerian parents. ^ a b Both Semi Ojeleye and Ike Anigbogu were born in the United States to Nigerian parents. ^ Tyler Dorsey was born and raised in the United States, but had acquired Greek dual citizenship due to his mother being Greek; Dorsey also represented Greece due to his citizenship under the name of Tailer Ntorsey. ^ Isaiah Hartenstein was born and raised in Eugene, Oregon, but holds official German citizenship with his father being a former professional player there. ^ Mathias Lessort was born in Martinique, a French possession in the Caribbean. It is an overseas department with the same political status as departments within metropolitan France. ^ Sasha Vezenkov was born in Cyprus and was raised in Greek communities in both Cyprus and Greece, but represents Bulgaria in international competitions. ^ "When is the 2017 NBA draft?". si.com. May 3, 2017. Retrieved May 3, 2017. ^ "NBA Draft: Celtics officially trade number-one pick to 76ers". Retrieved June 23, 2017. ^ "Celtics Complete Trade With Brooklyn Nets". NBA.com. July 12, 2013. Retrieved May 19, 2016. ^ "Inside the Numbers: Draft Lottery and Draft Position Q&A". NBA.com. May 8, 2017. Retrieved May 18, 2017. ^ "Nets Draft Picture: Brooklyn has picks, just not a lot of them". SBNation. Vox Media, Inc. May 16, 2017. Retrieved May 18, 2017. ^ "Celtics, 76ers finalize blockbuster deal to swap top picks". ESPN.com. June 19, 2017. ^ "Sixers Acquire Three Players From Sacramento". NBA.com. Turner Sports Interactive, Inc. July 10, 2015. Retrieved May 28, 2017. ^ "BULLS ACQUIRE DUNN, LAVINE AND MARKKANEN FROM MINNEOSTA". NBA.com. June 22, 2017. Retrieved June 23, 2017. ^ "Kings Acquire Hield, Evans, Galloway, and 2017 Draft Selections Team Sends DeMarcus Cousins and Omri Casspi to the Pelicans and Waives Matt Barnes". NBA.com. Turner Sports Interactive, Inc. February 20, 2017. Retrieved May 28, 2017. ^ "TRAIL BLAZERS ACQUIRE DRAFT RIGHTS TO ZACH COLLINS". NBA.com. June 22, 2017. Retrieved June 23, 2017. ^ "Nuggets Acquire Trey Lyles and Tyler Lydon from Utah in Draft-Night Trade". NBA.com. June 22, 2017. Retrieved June 23, 2017. ^ "Grizzlies, Cavs agree to multiplayer trade". NBA.com. Turner Sports Interactive, Inc. January 22, 2013. Retrieved May 27, 2017. ^ "Cavs Acquire Timofey Mozgov". NBA.com. Turner Sports Interactive, Inc. January 7, 2015. Retrieved May 27, 2017. ^ "Trail Blazers Acquire Jusuf Nurkić, 2017 First Round Pick from Denver". NBA.com. Turner Sports Interactive, Inc. February 13, 2017. Retrieved May 27, 2017. ^ Dowd, Tom (February 23, 2017). "Nets Shuffle to Start the Second Half". NBA.com. Turner Sports Interactive, Inc. Retrieved May 27, 2017. ^ "Bucks Acquire Jared Dudley and First Round Pick From Clippers". NBA.com. Turner Sports Interactive, Inc. August 26, 2014. Retrieved May 27, 2017. ^ "Bucks Acquire Greivis Vasquez". NBA.com. Turner Sports Interactive, Inc. June 25, 2015. Retrieved May 27, 2017. ^ Denton, John (February 14, 2017). "Magic Trade Serge Ibaka to Raptors for Terrence Ross and 2017 First Round Pick". NBA.com. Turner Sports Interactive, Inc. Retrieved May 27, 2017. ^ "5 Key Reasons Terrence Ross Trade Benefits Magic". NBA.com. Turner Sports Interactive, Inc. February 21, 2017. p. 4. Retrieved May 27, 2017. ^ "Trail Blazers Acquire Future First-Round Draft Pick, Anderson Varejao From Cleveland". NBA.com. Turner Sports Interactive, Inc. February 18, 2016. Retrieved May 27, 2017. ^ "Trail Blazers Acquire Unprotected 2017 First Round Pick from Cleveland". NBA.com. Turner Sports Interactive, Inc. January 6, 2017. Retrieved May 27, 2017. ^ "Lakers Acquire Brook Lopez, Kyle Kuzma In Trade With Brooklyn". NBA.com. June 22, 2017. Retrieved June 29, 2017. ^ "Houston Rockets trade Corey Brewer, 2017 first-round pick to Los Angeles Lakers for Lou Williams". NBA.com. Turner Sports Interactive, Inc. February 23, 2017. Retrieved February 25, 2017. ^ "Lakers Acquire Josh Hart, Thomas Bryant in Trade with Utah". NBA.com. June 22, 2017. Retrieved June 23, 2017. ^ Moorehead, Couper (June 28, 2013). "HEAT Acquires James Ennis in 2013 NBA Draft". NBA.com. Turner Sports Interactive, Inc. Retrieved May 27, 2017. ^ "Knicks acquire Bargnani in trade, sign Prigioni". NBA.com. Turner Sports Interactive, Inc. July 10, 2013. Retrieved May 28, 2017. ^ "Warriors Acquire Andre Iguodala from Denver Nuggets as Part of Three-Team Trade". NBA.com. Turner Sports Interactive, Inc. July 10, 2013. Retrieved May 28, 2017. ^ "Jazz acquire Novak through trade with Raptors". NBA.com. Turner Sports Interactive, Inc. July 10, 2014. Retrieved May 28, 2017. ^ "Thunder acquire Kanter, Novak, Augustin, Singler and draft pick". NBA.com. Turner Sports Interactive, Inc. February 19, 2015. Retrieved May 28, 2017. ^ "Sixers Complete Trade With Utah". NBA.com. Turner Sports Interactive, Inc. August 26, 2016. Retrieved May 28, 2017. ^ "Hawks Acquire Ersan Ilyasova, Trade Tiago Splitter". NBA.com. Turner Sports Interactive, Inc. February 23, 2017. Retrieved May 27, 2017. ^ "Brooklyn Nets Acquire All-Star Joe Johnson". NBA.com. Turner Sports Interactive, Inc. July 11, 2012. Retrieved May 28, 2017. ^ "Hornets Acquire 8-Time NBA All-Star Howard from Hawks". NBA.com. Turner Sports Interactive, Inc. June 20, 2017. Retrieved June 20, 2017. ^ "Pelicans Acquire Draft Rights to Frank Jackson". NBA.com. June 22, 2017. Retrieved June 23, 2017. ^ "Magic Acquire Six Players, Five Draft Picks in Howard Trade". NBA.com. Turner Sports Interactive, Inc. August 10, 2012. Retrieved May 28, 2017. ^ Konsens, Hunter (January 21, 2013). "Orlando Magic Are Officially Winners of Dwight Howard Trade". BleacherReport. Turner Sports Network. Retrieved May 28, 2017. ^ a b "Grizzlies acquire draft rights to Ivan Rabb and Dillon Brooks". NBA.com. June 22, 2017. Retrieved June 23, 2017. ^ "Suns Acquire Johnson and Pick, Trade Lopez and Warrick". NBA.com. Turner Sports Interactive, Inc. July 27, 2012. Retrieved May 28, 2017. ^ Aldridge, David (January 9, 2015). "Suns bolster frontline with acquisition of Wright". NBA.com. Turner Sports Interactive, Inc. Retrieved May 28, 2017. ^ "Cavaliers Acquire Casspi and Future First Round Pick from Sacramento in Exchange For Hickson". NBA.com. June 30, 2011. Retrieved May 18, 2017. ^ "Bulls Acquire Multiple Draft Picks for Deng". NBA.com. January 7, 2014. Retrieved May 18, 2017. ^ "Warriors Acquire Draft Rights to Jordan Bell from Chicago for Cash Considerations". NBA.com. June 22, 2017. Retrieved June 23, 2017. ^ "Philadelphia 76ers Acquire First-Round Pick, Justin Anderson, and Andrew Bogut From Dallas". NBA.com. Turner Sports Interactive, Inc. February 23, 2017. Retrieved May 25, 2017. ^ "Press Release: L.A. Clippers Acquire Rights to Jawun Evans". NBA.com. July 6, 2017. Retrieved July 6, 2017. ^ "Rockets Acquire Ty Lawson and Second-Round Pick from Denver". NBA.com. Turner Sports Interactive, Inc. Retrieved May 28, 2017. ^ "Bulls send Derrick Rose to New York in five-player deal". NBA.com. June 22, 2016. Retrieved May 18, 2015. ^ "Blazers sign Wright, trade for Lopez, Robinson". NBA.com. Turner Sports Interactive, Inc. July 10, 2013. Retrieved May 28, 2017. ^ "Bucks Acquire Draft Rights to Sterling Brown". NBA.com. July 6, 2017. Retrieved July 6, 2017. ^ "L.A. Clippers Acquire Rights To Sindarius Thornwell". NBA.com. June 22, 2017. Retrieved June 23, 2017. ^ "Grizzlies acquire Courtney Lee and 2016 second round Draft pick in three team trade". NBA.com. Turner Sports Interactive, Inc. January 7, 2014. Retrieved May 27, 2017. ^ "Nuggets Acquire Two Second Round Picks From Oklahoma City". NBA.com. Turner Sports Interactive, Inc. August 30, 2016. Retrieved August 31, 2016. ^ "New Orleans Pelicans trade point guard Tim Frazier to Washington Wizards for 52nd pick in Draft". NBA.com. Turner Sports Interactive, Inc. June 21, 2017. Retrieved June 21, 2017. ^ "Pelicans Acquire Draft Rights to Frank Jackson". NBA.com. June 23, 2017. Retrieved June 29, 2017. ^ "Cavs Complete Trade with Boston". NBA.com. Turner Sports Interactive, Inc. September 25, 2014. Retrieved May 30, 2017. ^ Cunningham, Cody (February 23, 2017). "Phoenix Suns Trade P.J. Tucker to Toronto". NBA.com. Turner Sports Interactive, Inc. Retrieved May 25, 2017. ^ "LOS ANGELES CLIPPERS ACQUIRE AUSTIN RIVERS IN THREE-TEAM TRADE". NBA.com. Turner Sports Interactive, Inc. January 15, 2015. Retrieved June 29, 2017. ^ "Knicks Acquire Alexey Shved and Two Draft Picks". NBA.com. Turner Sports Interactive, Inc. February 19, 2015. Retrieved May 30, 2017. ^ Goodman, Jeff (January 13, 2016). "College players given extra time to mull NBA draft decision". ESPN.com. Retrieved January 13, 2016. ^ Katz, Andy (June 24, 2015). "NCAA proposes new NBA draft rule to allow early entrants back in school". ESPN.com. Retrieved June 24, 2015. ^ "NBA announces early entry candidates for 2017 NBA Draft". Retrieved May 18, 2017. ^ release, Official. "NBA announces early entry candidates withdraw for 2017 NBA Draft". NBA.com. Retrieved June 23, 2017. ^ Helin, Kurt (May 25, 2017). "After 73 underclassmen pull out of NBA draft, here are the final early entries". Retrieved June 23, 2017. ^ release, Official. "Thirty-six international early entry NBA Draft candidates withdraw". NBA.com. Retrieved June 23, 2017. ^ Farrell, Perry A. (May 10, 2016). "Detroit Mercy leading scorer Paris Bass one of 2 removed from team". Detroit Free Press. Retrieved April 21, 2017. 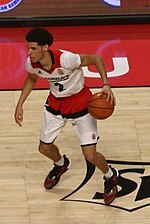 ^ "2017 NBA Draft - Prospect Index - NBA.com". www.nba.com. Retrieved June 23, 2017. ^ Nagy, Boti (March 1, 2017). "Sacre bleu! Jerome off to France but 36ers plan multi-year deal for NBL's reigning MVP". AdelaideNow.com.au. Retrieved March 1, 2017. ^ "DraftExpress - NBA Announces Early Entry Candidates for 2017 NBA Draft". Retrieved June 23, 2017. ^ "DraftExpress - 2017 NBA Draft Combine Invitee Breakdown". Retrieved June 23, 2017. ^ Jonathan Wasserman [@NBADraftWass] (May 5, 2017). "Official NBA Combine list, 67 names:" (Tweet). Retrieved June 23, 2017 – via Twitter. ^ Ford, Chad (June 18, 2011). "NBA issues 'green room' invitations". ESPN.com. Retrieved June 23, 2015. ^ "DraftExpress - NBA Draft Green Room Invites". Retrieved June 23, 2017.